Individual chapters and groups of chapters of the book 1957 Corvette RestoMod: Chassis Build Instructions for the Beginner. Author Steven E. Michael walks you through the entire restoration and build process of a 1957 RestoMod. Using the 1957 Corvette as the starting point, the chassis is upgraded with C4 Corvette (year 1996) suspension and steering components. Add a 1999 Corvette LS1 power plant and Tremec T56 manual overdrive transmission, and this will be one potent hot rod. Written for the beginner, by a beginner, the chapters speak in easy to understand language and take extra care in explaining the intracacies of restoring and modifying the C1 Corvette. Each chapter has detailed color photos with pointers to help illustrate exactly what to look for and what to do. Unlike any other car manual you have ever seen, this book will take the fear factor out of Corvette hot rodding. In this chapter of 1957 CORVETTE RESTOMOD: BASIC CHASSIS BUILD INSTRUCTIONS FOR THE BEGINNER, disassembly of the C4 Corvette front suspension and steering is fully detailed. With 41 color photos and 17 steps, you will see the easiest ways to get the Corvette's components off the car and ready for restoration. Tools are listed, both required and optional. And, organizational tips for identifying and storing your parts is outlined for you. Safely removing the front transverse leaf spring from the C4 chassis is the highlight of this chapter. Every small detail is covered for accurate and safe removal of the spring. Geared toward the novice, but valuable information for even the most experienced hot-rodder, this chapter is full of detailed steps to quickly and safely disassemble your C4 Corvette! NEW! Chapters are now packaged for the front and rear of the C4 Corvette - and at discounts from single chapter purchases! Author Steven E. Michael walks you through the entire restoration and build process of a 1957 RestoMod. Using the 1957 Corvette as the starting point, the chassis is upgraded with C4 Corvette (year 1996) suspension and steering components. Add a 1999 Corvette LS1 power plant and Tremec T56 manual overdrive transmission, and this will be one potent hot rod. Written for the beginner, by a beginner, the chapters speak in easy to understand language and take extra care in explaining the intricacies of restoring and modifying the C1 Corvette. With 39 color photos and detailed pointers to each procedure, chapter 6 fully explains the best way to disassemble the C4 Corvette rear suspension and drivetrain. The best tools to use and steps to follow are highly detailed for the beginner to safely remove all suspension parts, the brake and hub assemblies, and the differential carrier. One of the highlights is the safe removal of the composite leaf spring - always a difficult process. Written for the beginner, but valuable to even the most experienced restorer, every aspect of disassembly is included here - including organizational tips for marking and organizing removed components. This is a must-have for any C4 Corvette enthusiast! Chapter 4 covers how to rebuild front calipers and brakes for the C4 Corvette. Each step is detailed for the beginner, and even experienced restorers will find it useful. With 20 pages and 49 detailed photos, each step shows you what tools to use and how to perform the tasks. From disassembly of the hub and steering knuckle, to complete rebuild of the caliper hydraulics, this chapter shows any novice the correct way to rebuild their Corvette. The chapter also includes a parts list and suggested vendors. This is a must-have for beginners - written by a beginner! In this highly detailed chapter 5, the replacement of all the C4 Corvette's front suspension bushings and ball joints are meticulously described. The instructions are fully explained with 88 color photos and pointers for you to see exactly what to do. Sometimes more than one method can be used to remove and replace these overlooked, but vital, suspension pieces. Written for the beginner, details you won't see anywhere else are laid out in easy to understand language. Tools used, methods explained, and replacement parts identified, are all part of this well presented chapter. Written for the novice, but valuable to even the most experienced restorers, no other instruction manual has the detail of this volume. This chapter is a must-have for any enthusiast! Chapter 7 has 34 steps and 89 color photos that fully explain exactly how to rebuild C4 Corvette rear hubs, brakes, and calipers. Written for the beginner, by a beginner, it talks in plain language and details every aspect of the C4's rear hub and brake operation. Every photo has detailed pointers that identify exactly what should be done every step of the way. The complete rebuild of the rear brake calipers is one of the highlights of this chapter. Every facet of disassembly and rebuilding with new parts is highly detailed in this chapter. The chapter also gives you part numbers and available vendors for all replacement parts. This is a must-have for any C4 Corvette enthusiast! In chapter 8, the methods and tools needed to replace bushings and universal joints are described in detail. 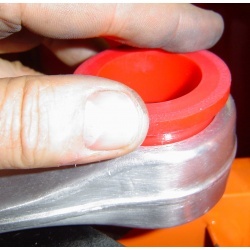 The locations and any modifications needed to accept the upgraded polyurethane bushings are highlighted and explained. Included are replacement of bushings for trailing arms, camber rods, anti-sway bar, spring bolt cushions, and carrier arms. 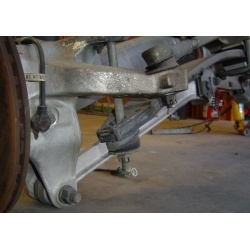 Also included is the correct way to easily remove and install new universal joints in the C4's axle shafts. With 32 pages and 78 detailed photos, this chapter goes into details not seen in any other instructional manual. Written in easy-to-understand language, this is a must have for the novice hot-rodder and the Corvette enthusiast. Chapter 9 explains the scary world of "pumpkins". Written by a beginner for beginners, this e-chapter shows you how to disassemble and rebuild Corvette Dana 36 rear axles. This detailed chapter describes how to replace axle, differential, and pinion bearings, cups, and oil seals. All in easy to understand language. Then it shows you how to "set up" the gearing to precise measurements. Most do-it-yourselfers would just buy a new carrier - at three times the price of fixing a used one! With 148 detailed photos and descriptive pointers, this chapter is 63 pages long and contains 56 specific steps any novice can follow and master. Most manuals talk over your head, but not this one. This easy to understand volume was written with the beginner in mind, because it's written by a beginner! Chapter 10 has complete instructions on how to rebuild the Dana 36 limited-slip differential for C4 Corvettes. Highly detailed and easy to understand, this chapter explains the best way to disassemble, inspect, and reassemble this vital component of the drivetrain. 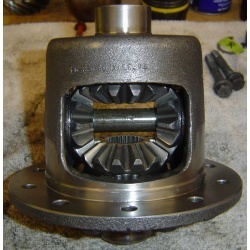 With 25 pages and 65 color photos, this chapter provides specific steps on how to rebuild your Dana 36 LSD, and without the use of expensive shop tools. Each step explains where the parts are and what their jobs are as it transfers power from the engine to the pavement. The chapter also points out what to look for in worn or damaged parts. Organization of the work area and your safety are always stated and shown to you. Written for beginners, by a beginner, it is unlike any other repair manual because it talks in your language - not over your head. This is a must for all do-it-yourselfers! 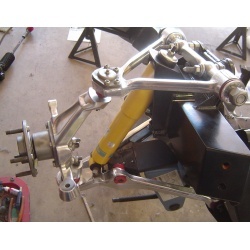 To take your project to the next level, why not polish the aluminum suspension parts? In chapter 13, everything you need to know to do this is outlined for you. Sanding and polishing tools and supplies are listed and explained first. Then the use of power tools to quickly and effectively repair and condition the surfaces is outlined. Next the uses and techniques of hand sanding with aggressive and fine grits is shown extensively. How to "read" the surface to progress to the next step is illustrated in detail. The polishing of all parts is described next. How to use a buffer and the best ways to use mini-wheels and bobs is also covered. Safety is always job one and I show you the safest ways to use the buffing wheel - which can be dangerous! Finally the chapter explains each part's unique sanding and polishing steps: what are the best sanding supplies and what polishing tools are best. As a bonus, other undercar and underhood parts are also illustrated. From stainless steel exhaust to steering shafts and linkage, to an aluminum battery box, this bonus section provides great tips for outstanding results. With 53 pages and 146 detailed photos, no other reference work gets into the details like this one. This detailed chapter shows how to test fit all suspension and powertrain components on a re-engineered 1956 Corvette frame. This "mock-up" stage is vitally important to ensure all parts fit and any fabrications or alterations are worked out. Also all fasteners, both stock and new, are specified for you. This makes for a "no surprises" final assembly later in the build. With late model C4 Corvette suspension front and rear, this chapter shows you all the small details and potential pitfalls you may run into. From how to best install the powerful transverse leaf springs, to suspension upgrade parts that can be used, the suspension sections are full of photos and steps that will make your project better. The final section shows how to test fit the LS1 engine and new Tremec T56 manual transmission. It illustrates the possible modifications you may need to perform, as well as the best tools for the job. Then the all-important measurement and correct installation of the driveshaft is detailed in easy to understand language. With 76 pages and 248 detailed photos with pointers, this chapter has outstanding information for first-time builders. Everyone has to start somewhere and this chapter speaks directly to the novice hot-rod builder. 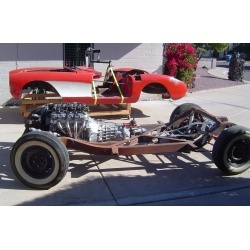 This package includes e-chapters 3 through 5 of 1957 CORVETTE RESTOMOD: Basic Chassis Build Instructions for the Beginner. 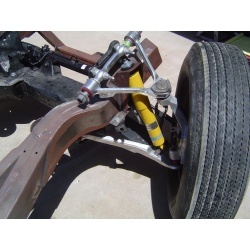 Chapter 3 shows the correct and safe method for disassembly of C4 Corvette front suspension and steering. 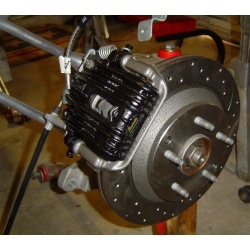 Chapter 4 illustrates all the steps needed to rebuild front brake calipers and restore the hubs and steering knuckles. And chapter 5 provides detailed steps in how to replace all suspension bushings and ball joints. This package contains 73 pages and 178 color photos that instruct and illustrate the correct steps, tools, and parts to completely restore the C4 Corvette front end. The end of each chapter contains part numbers and suggested vendors. Unlike any other manual, it is written for the beginner in easy to understand words and pictures. Author Steven E. Michael walks you through the entire restoration and build process of a 1957 Corvette RestoMod. Written for the beginner, by a beginner, the chapters speak in easy to understand language and take extra care in explaining the intricacies of restoring and modifying the C1 Corvette. Each chapter has detailed color photos with pointers to help illustrate exactly what to look for and what to do. Unlike any other car manual you have ever seen, this book will take the fear factor out of Corvette hot rodding. This e-book package includes instructions and photos to teach and illustrate how to restore the C4 Corvette rear end. 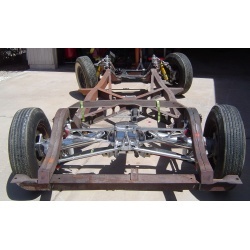 Chapter 6 shows the correct and safe method for disassembly of the C4 Corvette rear suspension. 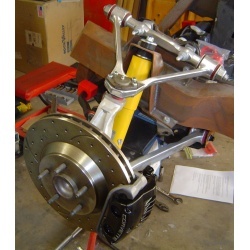 Chapter 7 details how to rebuild the rear calipers and hubs/spindle knuckles. 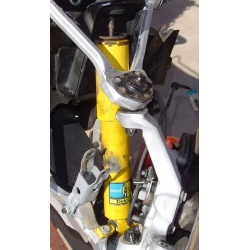 Chapter 8 provides detailed steps to install new suspension bushings and drivetrain universal joints. With 80 pages and 206 detailed photos, this package is written in very high detail and always with safety in mind. Unlike any other manual, steps are explained in detail, necessary tools are listed, and preferred parts and vendors identified.